It is day seven of Blogmas meaning it's time for our second Christmas gift guide! Today I am sharing with you my favourite gifts which are perfect for the men in your life! I really enjoyed sharing my women's Christmas gift guide with you all and I hope you enjoy this one too! I usually find it extremely difficult shopping for my dad and my brother, however my boyfriend is fairly easy to buy for; there's always something that he wants. "Everything a man needs for a smooth, comfortable shave in a single box. Contains our entire range of quality shaving products and a personalised, engraved aluminium razor handle". Cornerstone is a lovely brand which is specifically aimed at men and their shaving needs! I absolutely love how Cornerstone include a personalised, engraved razor handle; I think it gives a present that little personal touch! The quality of this product is absolutely incredible, it's definitely not cheap and nasty like a "use once and bin" razor! "Return to the cities of Rapture and Columbia and experience the award-winning BioShock franchise like never before. BioShock: The Collection retells the epic journeys of the BioShock universe beautifully remastered in high resolution". Men love games right? Or at least most men do. 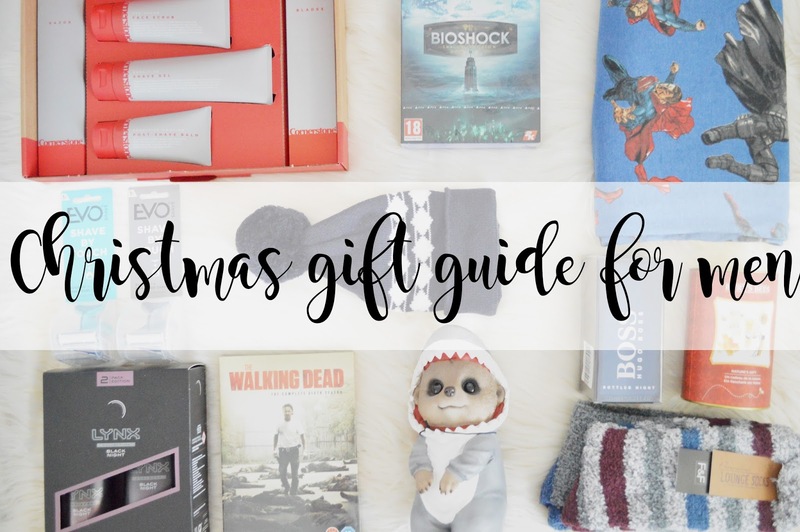 This game was specifically asked for by my boyfriend and I thought this would be a perfect chance to include the game into my gift guide! The trailer of this game looks incredible, if you haven't seen the trailer definitely check it out, your boyfriend, dad, brother or whoever you're gifting to may possibly love this! Lynx sets are one of them gifts which I buy for every male who I buy presents for each Christmas. They're an easy present and it's something which they always need but forget to buy. I personally love the scents "Black Night" or "Black". However there are so many different choices out there for you to choose from. Ooo a series! My boyfriend is a collector of many different series and The Walking Dead is one of his favourites and Season Six has just come out! It's a perfect gift for Christmas especially if you do not have the money to buy them for yourself as there are so many which come out! If you've never heard of Warm Penguins it's a new knitwear brand for men which has brought out beautiful jumpers and woolly hats for this time of year. The project is currently being funded for however if you head over to their website you will be able to find more information about their range and get yourself a little prezzie for someone at the same time! The quality of this hat is incredible, no itchy head anymore! This is a very random gift however I know it's a definite winner in my house! My brother absolutely love meerkats and Vivid Arts has brought out so many different Meerkats which are wearing the cutest outfits ever! I love vivid arts because the quality of their products are so realistic and brilliant quality as well. Although if you drop it; it will smash, so be careful. "Get the gift of all over natural care with Burt's Bees Nature's Gift gift set featuring hard working Coconut Foot Cream for tired feet, classic Hand Salve, Refreshing Soap Bark & Chamomile Deep Cleansing Cream to remove dirt, excess oil and make up and 100% natural moisturising Beeswax and Vanilla Bean Lip Balms for moisturised, healthy looking lips". What more could you want than soft feet and hands and beautiful lips? Burt's Bees is an incredible natural brand and perfect for dry lips and skin. I love this gift set because it's great for both men and women which is hard to find in hand and foot creams! If you saw my Women's Christmas Gift Guide then you'll know how much I love cosy socks and they have finally brought some out for men too! Tesco Clothing has brought out brilliant quality cosy socks for men in the nicest colours too! My boyfriend had never worn a pair of cosy socks in his life before he met me, and now he cannot go a day without wearing them! This definitely says something about them. Evo Shave By Touch - (Webite currently under construction). The shaving system is called "EvoShave and comprises a handle, disposable cartridge, tray, cartridge dispenser and reusable carry case. The handle acts as a bridge that enables the user to rest their fingers directly on top of the cartridge which allows the user to experience an extraordinary level of control when shaving their face. The handle with the bi-directional cartridge also allows the user to shave upwards 'against the grain' without to turn the handle over". Evo Shave is a new brand available which makes shaving easier for men! I really liked the idea of this way of shaving as it uses cartridges to shave instead of blades, meaning men shouldn't cut their face and neck while shaving, right? It's definitely worth the try! "One half of your off-duty costume, these Batman V Superman lounge pants from DC Comics are cotton rich and soft. Full length and finished with a elasticated waist with mock drawstring, the lounge pants are a nifty stocking filler for a super fan". Comfort, pamper; men need pyjamas too and these Batman Vs Superman lounge pants are perfect for any fan of Batman! They're soft, very baggy and not too think either like some Marvel lounge pants you can find! I love these and was very tempted to buy myself a pair too! "BOSS Bottled Night is the secret weapon in the BOSS man’s armoury of seduction, instilling him with the same compelling presence that underpins his success by day. A unique composition between elegance and seduction. An intense & spicy scent with a purposeful, edgy, masculine character". Last but not least, aftershave is a must present for anyone at Christmas. I have been thinking about getting this aftershave for my boyfriend for a while now and when I saw it on offer I had to quickly grab it! This scent is gorgeous!